Although I was able to do the first two posts of the AtoZ Challenge in chronological order, the alphabets won't allow me to do that for the remaining posts. 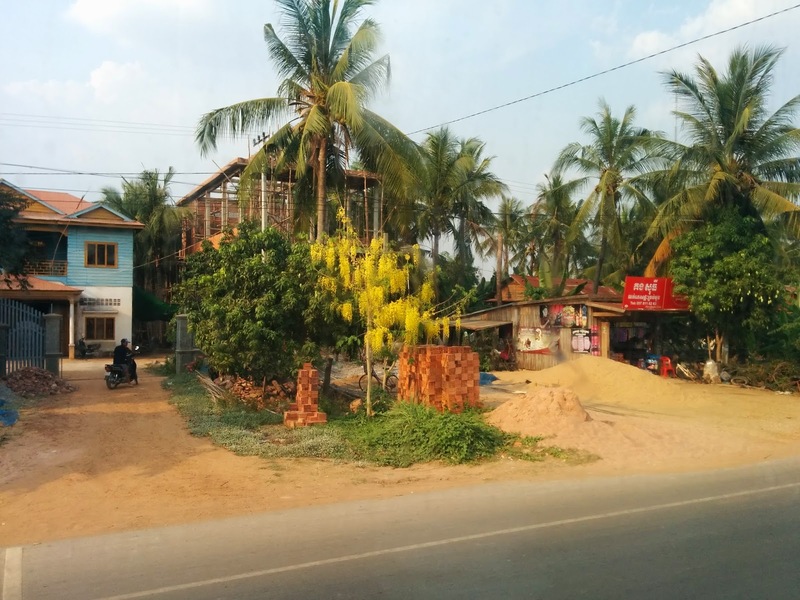 This post deals with our 'Crossing' of the land border between Thailand and Cambodia. So this technically takes place before all the other posts. Once I'm done with all twenty-six posts, I'm planning to do a 'summary' post putting it all together in chronological order. Back when we were researching the trip to Cambodia, we realized that flying there directly would cost a bomb. The next best option was to fly via Thailand. A budget airline has recently started cheaper flights between Siem Reap and Cambodia. The only catch was that these budget airlines charge you extra for things you take for granted on normal flights. That’s when The Husband remembered reading somewhere about buses between Thailand and Cambodia. "Hmm," we thought, "Why not try that option?" Not only would it cut our expenses, the prospect of getting out of the normal tourist circuit and seeing a bit of rural Thailand and Cambodia was appealing. And crossing the land border between two countries and briefly being in ‘No Man’s Land’ for some time? What an adventure! Arriving by flight at a new country started to seem pretty meh. Some more research later, we learnt that until 2013, tourists who wanted to reach Siem Reap by bus had to go from Bangkok to Aranyaprothet (the Thai checkpost closest to Siem Reap) by bus, cross over to PoiPet (on the Cambodian side), and then arrange their own transportation to Siem Reap from there. This obviously resulted in a whole bunch of scams. But Thailand now has a bus which connects the two cities directly. The whole trip would take about 6-7 hours. Not only that, tickets were available online! Obviously, we were much prompt in booking. 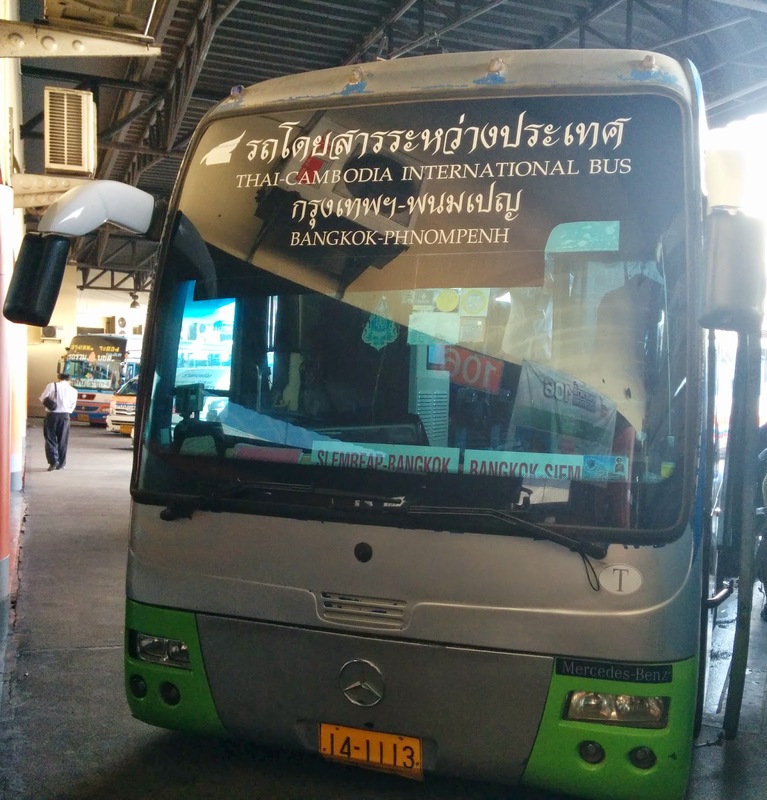 The bus starts from Mo Chit bus station every day, we learnt. There are two buses that run every day - one at 8 AM and one at 9 AM. We chose the later one so that we wouldn't have to wake up too early. When the bus left Bangkok that Wednesday, there were only fourteen people on board. It took us an hour just to get out of Bangkok, and I started to wonder about this "6-7 hours" story. The ride on the Thai side was pretty uneventful - we stopped at a service station at about 10:30, but that was it. About five kilometers before the border, the bus stopped to pick up lunch for the passengers. It was there that the first interesting thing happened - the bus company tried to scam its own passengers! He didn’t bother to mention the fact that they would charge $38 for that visa, as opposed to the $20 that the Cambodian authorities would charge at the border. Luckily, most people on the bus had read about this particular scam already. The two people who did get off quickly got back on when they realized something was wrong. So they netted no fish from our bus. And now begins the main part of the story - the actual crossing! 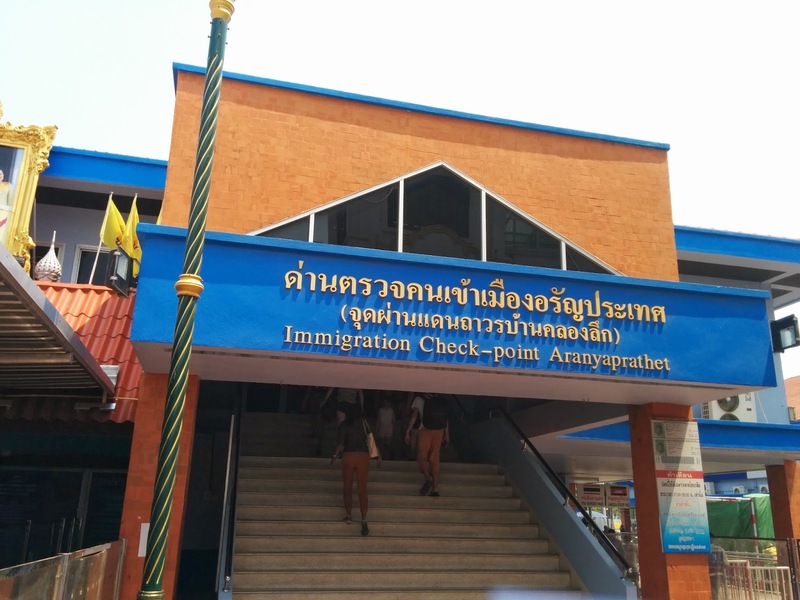 The immigration check-point at Aranyaprothet was pretty uneventful - we stood in a long queue, got our passports stamped, and walked out on the other side and out of Thailand. And then, for a glorious couple of minutes, we were on No Man's Land. I don't know how it is at other borders, but we had to cross a short land bridge to get to PoiPet. Ahead of us was the spired gateway welcoming us to Cambodia! On the other side, a signboard directs people according to whether they already have their visa or not. We had taken the precaution of applying for an e-visa, so we proceeded directly to Passport Control. On the Cambodian side, the difference in prosperity levels between the two countries was clearly visible. Whereas we had queued in an airconditioned room on the first floor of an official building on the Thailand side, the ‘Arrivals’ hall for Cambodia was just a shed, open on two sides. But interestingly enough, each of the Cambodian counters had a fingerprint machine. We hadn't been asked to give our fingerprints for the Thai visa. We filled up our Arrival cards and stood in another long queue to get them stamped. And then something strange happened. When The Husband got to the counter, he was asked to step aside. A uniformed Cambodia official took him (with me tagging along behind) to another room with dark windows. He asked me to wait outside. I waited outside that room for what seemed like ages, with no idea of what was happening inside. Were they interrogating him, were they beating him up, were they torturing him? After an agitated ten minutes, I cautiously opened the door and peeked in. I saw a desk with an officer behind it, and The Husband standing nearby. He gestured that everything was okay, and I closed the door. But not before wishing that they'd asked me to go inside as well - that damn room was airconditioned, and I was slowly getting boiled in the heat outside! Later, the husband told me that they had, in fact, been interrogating him. What was his purpose in coming to Cambodia, which hotel had he booked? They even called up our hotel in Siem Reap to confirm that we were, in fact, booked there. Whew. Anyway, after they were satisfied that we were genuine, they took us back and deposited us at the head of the queue again. After that, everything was normal - we gave our finger-prints and photos, and got our passports stamped. I still don't know why they it happened. Was it a normal 'random check' that we were unfortunate enough to get caught in, or do they do this for everybody who's got an e-visa? If the latter, that's pretty stupid, because that would disincentivize people from getting an e-visa. An e-visa obviously reduces the processing time at these crossings, and also earns them five dollars extra. So in the end, the e-visa didn't do us much good. We spent almost as much time there as the people who hadn't got a visa. Not only that, since the bus could only move after all the passengers had gotten their passports stamped, we were stuck there till all sixteen of the others got their visas. In fact, the bus nearly left one girl behind because she ran late. Despite having passenger lists, they didn't bother to check if everybody had got back to the bus! Siem Reap is another two hours from PoiPet. The roads aren't as great as on the Thai side, but are still good enough - at least, they're way better than how I imagine Indian roads in similar far-flung places would be. The Cambodian countryside reminded me very much of Kerala - the coconut trees, the mango trees, the yellow kanikonna. Since it was mango season, the mango trees had hundreds of mangoes, strung up like Christmas lights. The trees looked different from the ones here in India, though - they're much shorter, and the mangoes hang a long way down from the branches. You can see one in the below photo (below the coconut tree and next to the yellow kanikonna). In the end, the entire journey took more than 9 hours. The border crossing itself took 1.5-2 hours. It was past six by the time we reached Siem Reap. So I would definitely NOT recommend this option for anybody. If you can afford the flight, do yourself a favour and take the flight. Never mind the romantic notion of a land crossing. Oh my god, it must have been terrifying what happened with your husband! I'm amazed you remained so calm, I would have been freaking out! Weird that they interrogated your husband too - very random...Did anyone else on the bus get that treatment? 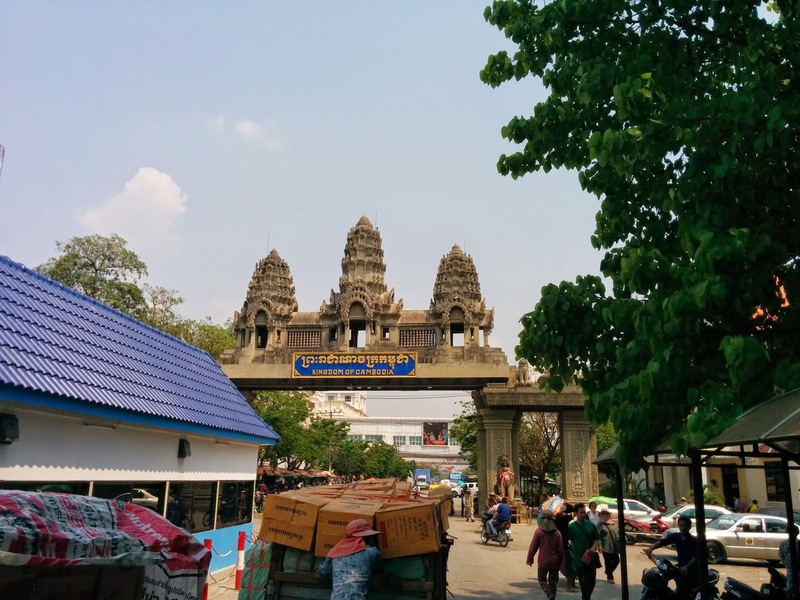 We took the bus around Cambodia too, it's a much more visceral experience than just taking a plane or taxi...Although at one point the bus stopped for a pit stop, we got off to stretch our legs and then the bus drove off with our bags still inside! Turns out it was only going to park up somewhere for a lunch break and was going to come back half an hour later, but we didn't realise this and no one spoke English - the locals found our panic hilarious though, quite a few were laughing at us. All worked out in the end, massive panic at the time though! The not so fabulous side of travel! And I thought I was persecuted at airports; I always seem to end up being swabbed for explosives. If there's a physical profile for plane hijackers it must be 'short, fair-haired female', I'm sure! Celine: Whoa - that sounds scary! They should have at least told you they'd be back! Rosie: Hehe... Indeed it was. Aarthi: Please do. This bus thing's just not worth it. Though it might a bit better if you're driving down - except that Cambodians drive on the right, which might be a bit hard to get used to. Donna: Haha! Maybe they think you're a tall well-muscled guy in a very clever disguise.